“The submarine crouched on the bottom of the coral paved harbor. At intervals there sounded a dull, bubbling ‘whoom,’ and the pig boat rocked as Jap destroyers churned the sunlit waters far above laying patterns of depth charges. Close inshore floundered a troop transport; nearby the mast-tips of two destroyers barely showed just above the green ripples. This sub captain never banked on luck; his ship always laid its tin fish in sets of twins, and the enemy wanted that sharpshooting undersea boat out of action immediately. “On every front men are turning more and more to this powerful Being we call God whenever they need help. Those who, through early training or lack of it, need help in finding Him turn to the chaplain -or Holy Joe- for help first. From these overworked but inspired and seemingly tireless individuals they learn that next to God, their best pals are Mom, Dad or the wife. 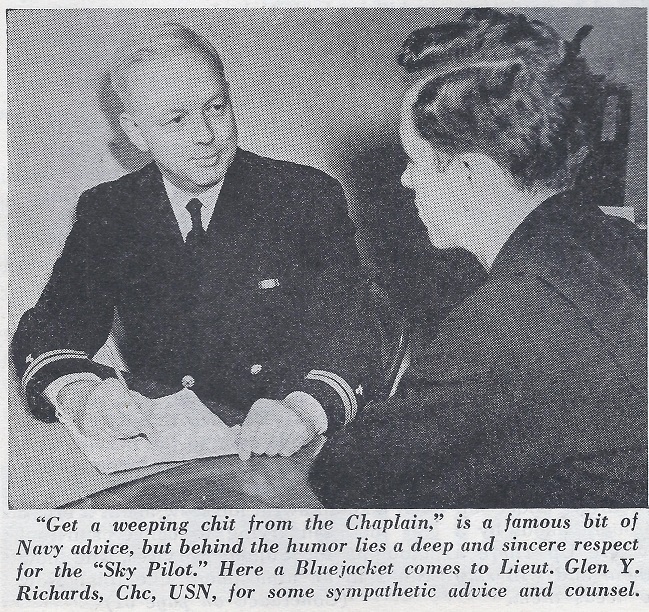 “As a one-man welfare committee, each chaplain has his hands full 24 hours a day, and when complaining seamen are gruffly advised, ‘Aw go tell your troubles to the chaplain,’ their councilors mean just that. Life in all its designs passes through the chaplain’s office; advice is sought on subjects ranging from the abstract spiritual to spirits of a liquid nature, from courtship to court marital, or a man may just want a good listener. Should a sailor be anxious to get married and no time can be lost, everything is stopped while the chaplain speeds the couple to the chapel so they may sort of fight this war in double harness. “Prior to 1799 the captain of a vessel selected from amongst his crew, a minister and gave him a ‘warrant’ and a Bible to perform his duties. His services, while inadequate, were the best that the time could offer and he was small comfort in time of death. “The foundation of our Chaplain Corps was laid in 1799 with the appointment of the first Navy Chaplain, William Austin. Congress, hearing of the fine work of the chaplain, authorized divine services, just one year later, to be held aboard all armed vessels. Many ministers took advantage of this opportunity and made applications to serve with the armed vessels. Congress had to call a halt, and in 1842 they limited the total number of Navy Chaplains to only 24. “This number seemed adequate until the year 1914, when our pre-war navy began to expand and the influx of personnel created a ratio of one chaplain for each 2890 men. The chaplains could not cope with the task, so Congress promptly lowered the ratio to one chaplain to 1250 men. They also set a ratio of commissions to ten percent of chaplains would be Captains and twenty percent Commanders. This ratio exists even today. When this war started there were about 100 chaplains in the naval service; today there are almost 2000. “It takes a world of stamina to live up to the schedule followed by Navy Chaplains, but these men ‘can take it’; in fact, the Navy sees to it. Each applicant must undergo a stringent test before receiving his commission. 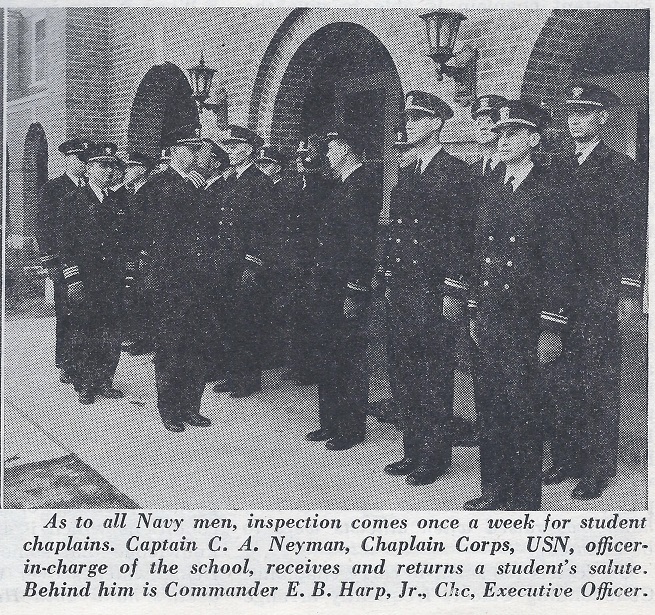 Necessity in 1942, caused Navy Chief of Chaplains, Robert DuBois, to organize the first school for training chaplains in naval history at Norfolk, Virginia. Taxed to capacity, the center soon moved to William & Mary College at Williamsburg, Virginia. 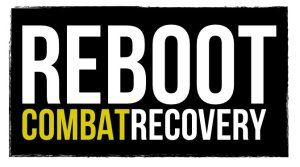 There groups of 25 to 40, ranging in ages from 21 to 45, go through intensive training similar in many respects to that doled out at boot camp. For three months the prospective chaplains alternate between classroom work and field work; only about two percent, it is reported, fail to fulfill the necessary requirements. “Upon graduating, the Sky Pilots become subject to a peculiar law that was guided through Congress in 1926 by Chaplain Evan Scott, the ‘Staff Equalization Bill,’ which places chaplains on a level with line officers. Each chaplain is assigned a line officer, with the same date of commission, as a running-mate. When the line officer is considered for promotion, the chaplain is also considered. In addition, the chaplain receives the pay and wears a uniform comparable to his running-mate. “To accomplish this gigantic task, a system was devised, which is, as far as is generally known, the first of its kind in the history of the world. All chaplains . 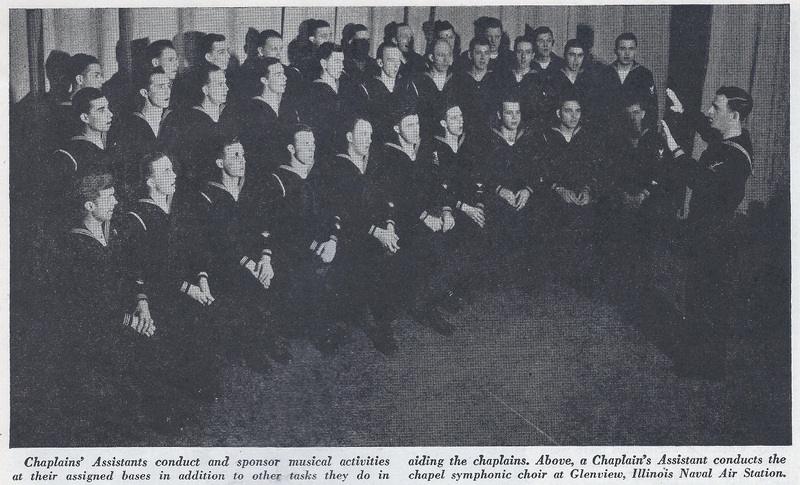 . . Protestant, Catholic and Jewish who are indoctrinated at the Naval Training School for Chaplains attend the same lectures, live and room together and are taught to render spiritual services to those of other faiths. If a Catholic is wounded and faces a critical hour, a Protestant chaplain is able to give the Crucifix to the man and assist him in his prayer of contrition. Likewise, a Catholic chaplain carries in his kit a special prayer book which he may give a Jewish lad and assist him in performing his religious rites when the time arrives. Along with this and the general body toughening exercises, chaplains also receive training in First Aid and are many times stationed at one of the dressing depots to help the medical officers as well as comfort the wounded. “On ships at sea men of all faiths attend religious services, and it should be stated here that there is just something about war, whether it is fought in a foxhole, a gun turret, landing craft or war plane, that does not encourage atheism. In fact, a count was taken aboard a ship headed for battle which showed there were a surprising number of atheists present. After the battle not a solitary hand was raised when atheists were to be counted. 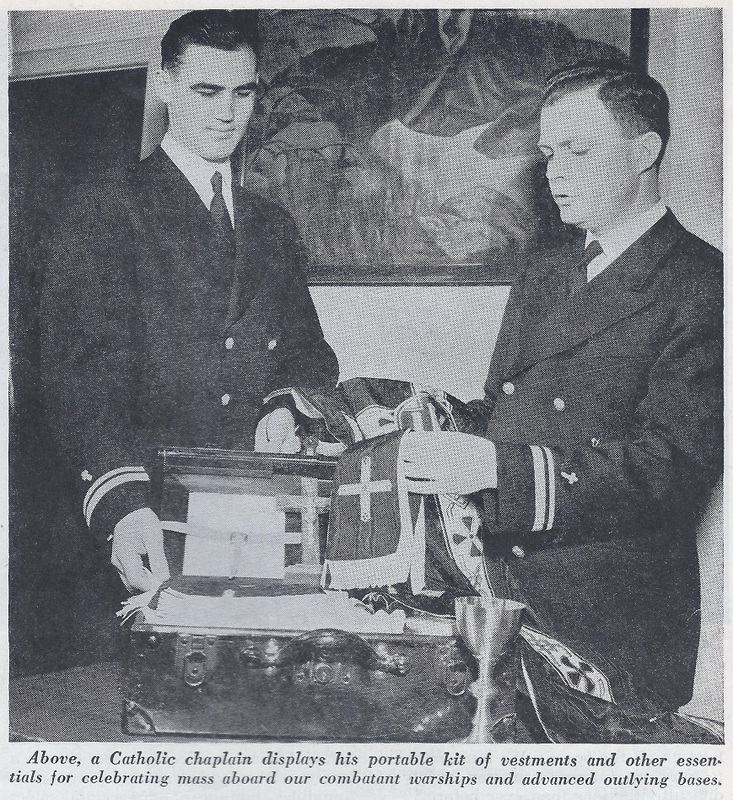 “On vessels too small to carry chaplains, Commanding Officers frequently arrange for informal divine services. The normalcy of religious life aboard ship would probably astound most church-goers at home. Divine services at sea or on a lonely isle may be amid strange surroundings, but the hymns are the same; the man may be dressed in dungarees instead of dress blues, but they are, for the most part, the same men who would be attending church if they were at home. “The words ‘Bringing God to men and men to God-the Navy way’ is the motto these men live by as soon as they become Navy Chaplains, and from all indications their work will have far reaching effect. “When a man is assigned to your gun-team, you don’t care what his religion is, just as long as he can feed the shells fast enough or hits where he aims; nor if a man is sneaking along a jungle trail and spies a buddy protecting his flank, he doesn’t care whether he wears the Star of Judea or the Medal of Saint Christopher, just so he can fight. “Navy’s Holy Joe’s are just about the last group in our armed forces who go into battle unarmed; so along with physical fitness of the highest degree, these men must possess courage in unlimited amounts. No one has ever found a chaplain without courage. NOr will he. It is apparent they eliminated the word fear from their vocabularies when they began preaching the word of God. Cautious? Of course! How else may they live longer and more useful lives for the fighting men, but they, themselves, speak of a peculiar feeling of security under all conditions which is brought about by a knowledge that somewhere Up There a Being watches over them and will stay death’s hand until He needs them. “Such a feeling must have inspired the actions of a chaplain during the first landings on Guadalcanal when he dutifully helped set an example during a doubtful moment. They tell of ‘a second of wavering uncertainty and doubt.’ The first ones ashore, as yet unchristened by battle, had been keyed up for Jap resistance on the beaches, then momentarily disconcerted by its failure to materialize . . . except in the form of snipers. Nobody ventured to lead, so a Colonel stepped out into the clear with his pistol drawn. Instantly a chaplain, unarmed as all chaplains are, stepped out right behind him. In that one heroic moment, all doubts vanished as someone hoarsely whispered, ‘If Holy Joe can go out there, then who in hell are we to be standing here and holding back?’ Every last man of the landing party swung out into the clear, in step behind Holy Joe. “The occupants of the place looked at one another sheepishly and ‘knocked it off’ because first, they loved the chaplain and second they knew only too well that he could do as he threatened . . . behind that head thrust through to tent flap extended a body 6 feet-3 inches long, and built as tough as a commando or ranger. “They say ‘God is on the side of the mightiest legions.’ In the writer’s opinion, that should be changed to ‘God is on the side of those know him best.’ and with the 24 hour service rendered by Navy Chaplains the men in our Navy and God do not remain strangers very long. Their efforts, moreover, seem destined to outlast the war. To look only as far as the war’s end is being downright shortsighted; we should examine what will come after, for we of the armed services will have a lot more to say about how the post war peace will function than did our dads when they came home from the last one. On the shoulders of our Navy Chaplains rests a great deal of responsibility of seeing that we don’t make a mess of that Peace after we have won it! Text and pictures from “Our Navy” magazine, 1 March 1944, pgs 4-6, 31 (author’s collection).